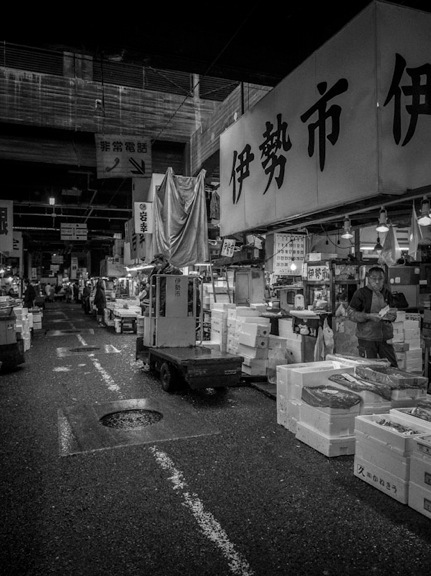 After my post about our amazing visit to Tsukiji Fish Market t I went through my pictures again – there are more than 400 from the market. Surprisingly there are some that I converted into black and white and I liked them a lot better. Here are my favourite black and white pictures, taken with my OMD EM-5 and a 12mm/2.0 lens. The first shows one of the bigger market streets, where the trolleys whiz past you and you often have to jump out of the way to prevent being hit by one of the trolleys. If you get too close to one of the trolleys an angry driver will shout at you, if not more. 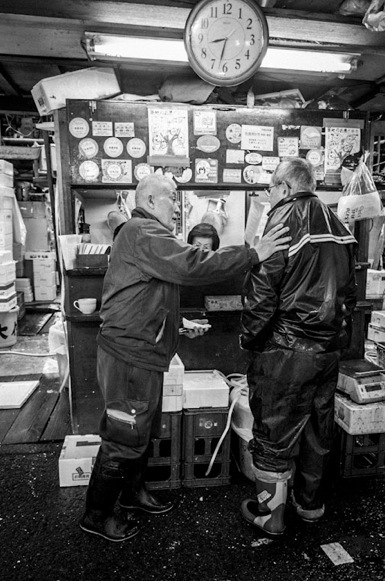 The second picture shows one of many scenes I witnessed during our two visits to the market – after the rush is over at around 8am the traders chat and joke with each other. They often share a meal together or just have a coffee, but there is friendly banter and lots of camaraderie to be seen. 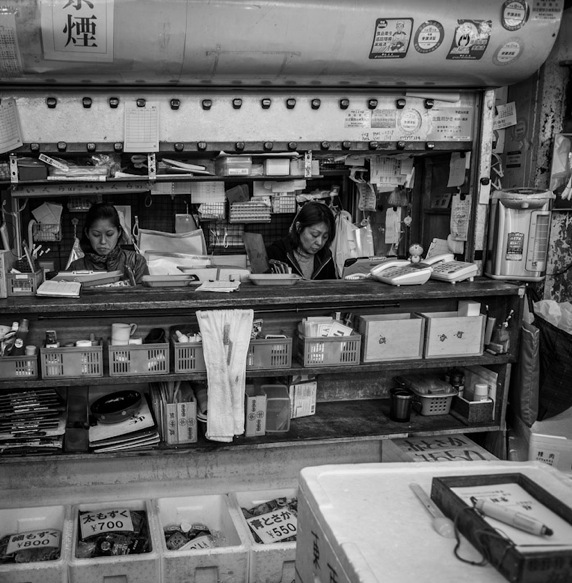 The wholesaler shops are split into the fish mongers (all men) that do all the hard work – from dissecting the fish to wrapping and packaging – and then there are the women that sit in the small boxes and handle the payment. They are in charge of the money and keeping the books. They always seem to be concentrating and adding up the latest sales. 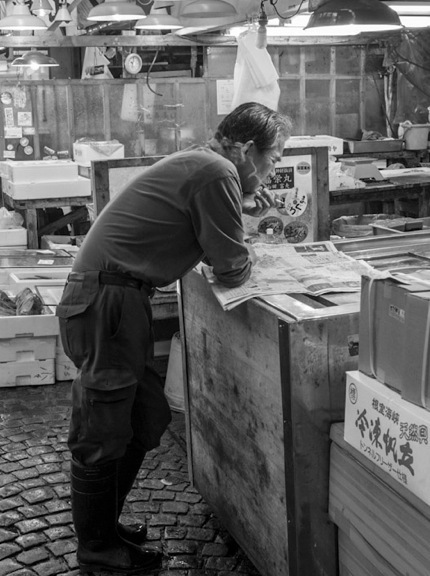 Once the traders have a break and they have caught up with their colleagues for a chat, we saw a few of them just reading the news papers or enjoying a smoke. Or doing both. Maybe something to calm them down after a busy day? 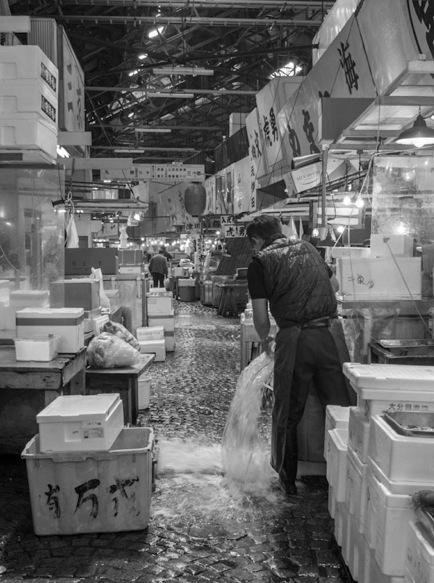 Finally the day ends for the traders, the stock has gone and the stalls are being washed and cleaned. The fish market is closing down for the day. Another morning, another day and trading will resume again.